A classic keelboat, the largest of the Alfred Westmacott designs, the Solent Sunbeams at Itchenor range from 95 years of age to new all-GRP and newly epoxied yachts, yet all racing on level terms. Read about our history. Highly competitive regular racing in a one-design fleet with no restrictions for tides on most weekends and Thursday evenings from March to October. Read more about racing a Solent Sunbeam. Beautiful lines with great handling across the whole wind spectrum. Often just one crew member needed in boats that are suited to both men and women. A well-organised crew/helm request system as well as training sessions and a welcoming attitude to new sailors. Read more about crewing opportunities. 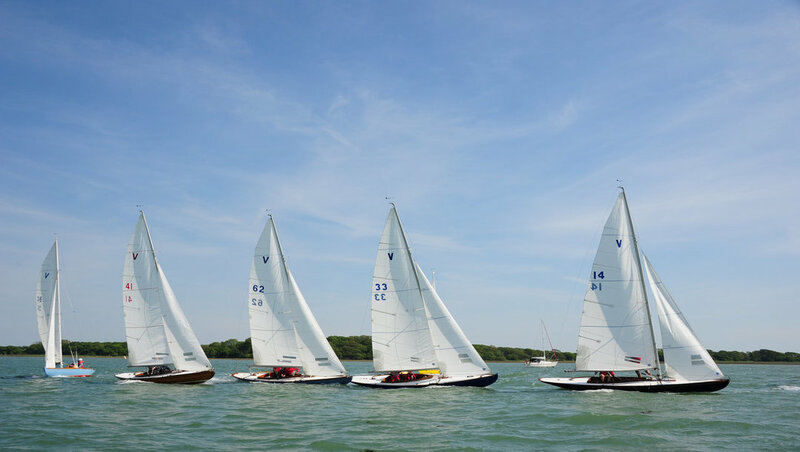 Annual racing at Cowes Classic Week and Cowes Week with passage races. Read more about our racing programme. Sheltered moorings in beautiful Chichester Harbour. Great camaraderie and community spirit in the Class and Club with many social events. Read more about Itchenor Sailing Club.